I like my zongzi simple. Pork and rice. I remember making these with my mom when I was younger. 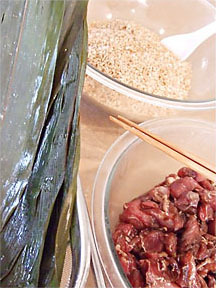 Zongzi, a traditional Chinese food, is basically bamboo leaves stuffed with glutinous rice and your filling of choice. Personally, I don’t care for the peanuts, mushrooms, chestnuts, chinese sausage, and dried shrimp people sometimes stuff them with. Pork, that’s all. Nice and simple. For the meat filling, skin the pork hock and remove the bone. When you buy the hock, it will be about 4 lbs with the bone… basically both of the front legs. Mommy says the front leg is more tender. Cut the meat into 1 inch pieces and save some of the fat. 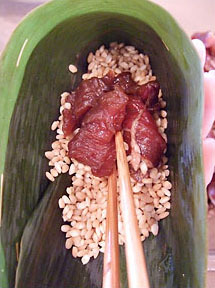 Marinate the meat in a bowl with soy sauce, rice wine, five spice powder, and ginger. Cover and marinate overnight in the refrigerator. Rinse the rice a few times and drain. Add soy sauce and store in refrigerator overnight or allow to stand at room temperature for at least 2 hours so all liquid is absorbed. Soak the leaves in tap water overnight or in hot water half an hour before wrapping. Good morning… now you have everything ready to assemble! Select 2 leaves of relatively the same size, stems facing opposite directions, glossy side facing you, and overlap them to make a 5 inch wide piece. Now, turn it horizontally and fold the ends towards you forming a heel shape. 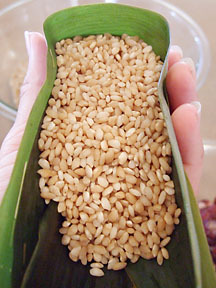 Place 2-3 tablespoons of marinated rice in the “cup” and spread it about 3 inches toward the leaf tip. Please a few pieces of the marinated meat over the rice. Add a couple tablespoons of rice over the meat. The meat should be completely enveloped by rice. 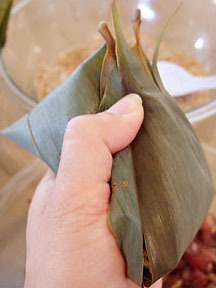 With your right hand, bring the empty bottom portion of the leaf over the rice-filled cup, curving the leaf over the sides and beyond the heel side. 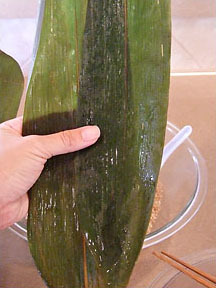 The tips of the leaf should extend a few inches beyond the heel. Tie the string around the zongzi so it’s a secure package. Do not tie the string too tightly as the package will expand when cooked. 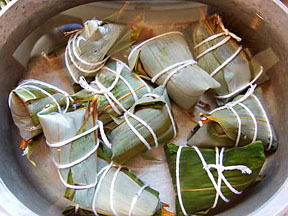 Place the zongzi in a large pot or Dutch oven. Add water to cover, with a couple inches to spare. Cover the pot and bring to a boil. Cook on medium-low heat for an hour, then turn down to low heat until the water is barely simmering and cook for an additional 3 hours. Make sure there is boilng water covering the packages at all times. To eat, snip the string and lift off the pointed part of the leaf. Serve with soy sauce. Nom.